We are a semi-vanilla SMP whitelisted Minecraft community that has been gaming together for over 5 years. We opened our first survival world on December 7th, 2016 and will be opening our newest survival world once 1.13 releases. Our aim is to provide a safe, friendly environment for mature (18+) gamers. While Minecraft is our main passion, our community also plays many other games together such as Rocket League, Overwatch, PlayerUnknown’s Battlegrounds etc. We also occasionally host a modded minecraft server to cater for the community’s interests. Outside of the online world, we have developed strong friendships with many of our members regularly meeting up in real life. The foundation of Casa Nirvana takes place on our Survival Server where we have a beautiful world only running the one-player-sleep plugin. We also provide a Creative Server to design your builds with friends. Additionally, we run monthly events where we host mini-game events and UHC events. Whether your jam is a PVP bow map or a hide-and-seek minigame, we do it all. Besides our Minecraft servers, additional Casa Nirvana features include a Discord Server, Overviewer Map, Steam Group, Plug.dj Page and more. As a group, we feel it is important to use our shared hobby of gaming to give back to the world through hosting biannual charity events. These events involve the wider gaming community to reach a greater audience and always have a charity we feel passionate about. Our last charity event was a 24 hour livestream event hosted in December for Ditch The Label, an Anti-Bullying organization in the UK & US for teens and young adults. This event raised £1,195.91 and supported the online resources that Ditch The Label provides to its community in aid of mental health and anti-bullying. We also hosted an event in July, 2017 in aid of an organization called YoungMinds which focuses on the wellbeing and mental health of young people. We raised £1196.30 during the YoungMinds event and made a huge impact on mental awareness. We always look forward to meeting new people and making new friends. We welcome all players, regardless of experience. With our upcoming new survival world with the release of 1.13, now is an exciting time to join our community. 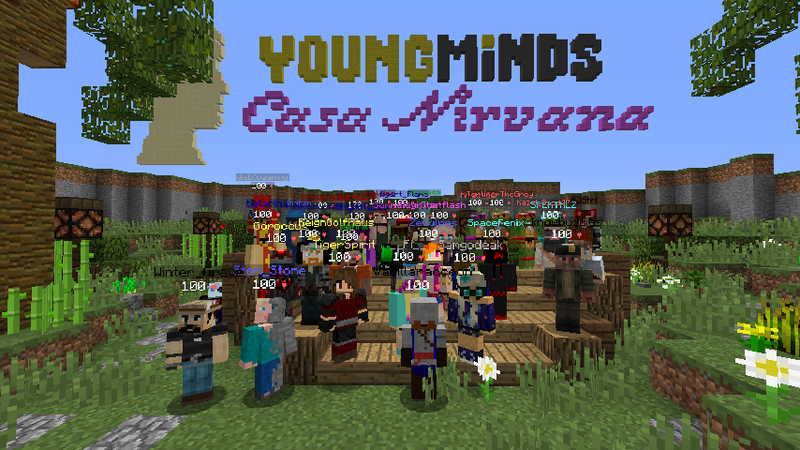 If you are considering applying to Casa Nirvana, we encourage you to discover more about our server and community including our code of conduct, images, and videos by visiting our website at www.CasaNirvanaSMP.com.